Ken Done began his day today as he begins every other day: by swimming in Sydney Harbour. “Look, at this time of the year, it’s more of a plunge, than a swim. I think for a swim you’ve got to be in about 20 minutes. I was in just about long enough until your balls end up the size of blueberries and then I had to get out. “Use that as a headline,” jokes Done. How does ‘Ken Done’s balls are the size of blueberries’ sound? Fine, “But a very nice blue”, he adds by way of a caveat. Done, evidently, knows his way around a headline and a soundbite as well as he knows his way around the very harbour that he helped make famous in his own way, and made him famous in return. Today, however, he’s stepping out of one of his elements and into another more forgiving one. Done is a quick phone call away from taking his grandchildren for lunch at the Museum of Contemporary Art, a hop, skip and jump away from his eponymous gallery and studio in the heart of The Rocks. As recently as last month, the MCA played host to one third of the inaugural edition of The National, a new biennale staged across three venues and dedicated to exploring new forms of challenging contemporary Australian art, the kind that seems intent on pushing whatever boundaries it can get within reach of. While the museum’s collection does not include any of Done’s work, Done himself once tested – albeit under vastly different circumstances and using a much, much brighter palette – similar boundaries, particularly those that exist between art and commerce, mastery of craft and mover of merchandise. The embrace of those reverent art institutions, however, has proven to be more elusive – not that he has never needed it to stay warm. Done didn’t make it to The National this year; travel throughout London, Jordan and Israel, Finland and Norway prevented him from doing so. That, and the indefatigable artist, now 77, has taken on a number of projects that have been occupying a great deal of his time of late. At age 40, Done came relatively late to a full-time art practice, and when he did it was with an undeniable knack for design and branding that would catapult his eponymous brand – designed alongside his wife Judy – into stores, homes and the collective consciousness across Australia, and eventually, parts of the world (their work proved particularly popular with the Japanese). Done tells GRAZIA that he never personally saw a disconnect between the dual identities of Done the man, the artist and the brand, but that “there were some people in the older, slightly more conservative area of the arts, for instance, who didn’t quite know how to come to terms with it. In October this year, Done will self-publish a book called Paintings You Probably Haven’t Seen. True to its name, it consists of paintings made between the start of this century until the present day. “I really hope it might open people’s eyes to what I’ve actually been doing, rather than what they think I’ve been doing”, he says. Included amongst his most recent works are three “quite large, reef-related paintings” that he describes as being similar in nature to the markings-based works of Cy Twombly, the great American abstract expressionist. On the day that we talk, Done spent time that morning working on the third and final part of the triptych. “It’s a political painting in the sense that, if you think the reef looks lovely, well it’s another little reminder that we should be looking after the Barrier Reef.” He visited the Great Barrier Reef as recently as last year, and says he noticed “some changes, there’s no doubt about it”, yet in the truest spirit of a Ken Done work, he remains hopeful about its future all the same. Done, of course, could never be accused of being simple. He famously spent much of the 1960s working in London and New York as the art director of J Walter Thompson, an ad agency whose clients included The Beatles and Campari (he won a Cannes Gold Lion for the latter). 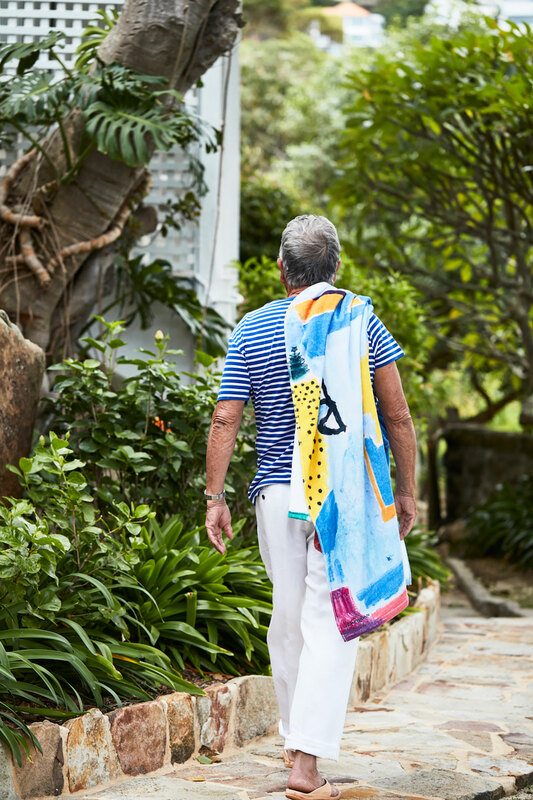 Along with his wife, Done established on of Australia’s most iconic lifestyle brands, carving out an ebullient image of life that filtered into countless homes, not unlike the very sunlight Done himself seems intent on capturing with each gesture. Their designs for apparel and homewares alike were, to put it mildly, ubiquitous at the tail end of the 20th century. You’d be hard pressed to find a child who hasn’t been wrapped in a Ken Done beach towel after swimming in the harbour – myself included – or slept, as many others did, under a Ken Done painting. It’s for that reasons that the second project Done has been occupied with lately will doubtlessly strike a nostalgic chord for many. 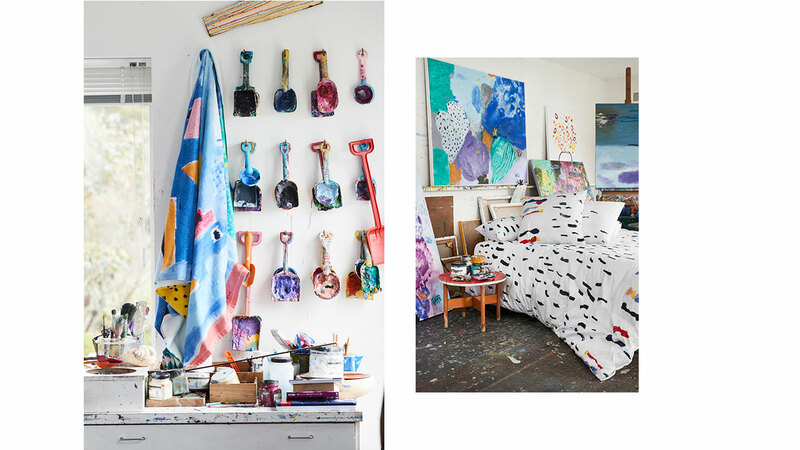 Done has revisited his collaboration with Sheridan, first undertaken some 30 years prior, with a new range of linens, towels and cushions for the home. Done ranks his first collaboration with the brand as being amongst his most successful, not only for its time but in the intervening years. Not that there have been many other collaborations in “a very long time”, he’s quick to add. He did donate his 1984 Barrier Reef Garden painting to a design for a pair of Havaianas thongs, with the stipulation that a portion of the proceeds be donated to the Great Barrier Reef Foundation. This new collection, however, has been distilled from a body of new works Done submitted that numbered close to thirty. The greatest change, Done says, between his first and second collaborations is that the silk screen printing techniques of the past have been supercede by digital reproductions that the artist says capture “every single brushstroke, with every little nuance of the brushstroke, is there in the printing.” The finished product is pure Done: a summer Saturday spent sailing is made manifest on a velour faced beach towel; subaqueous schools of fish adorn cushion covers; and, perhaps most unexpected, a glacial landscape inspired by a recent expedition Done made to the Antarctic Peninsula is splayed across a bedspread. Done finishes that train of thought at that, but not before adding that he recommends I add the destination “to my ice bucket list.” A very nice, blue bucket list it would be then. 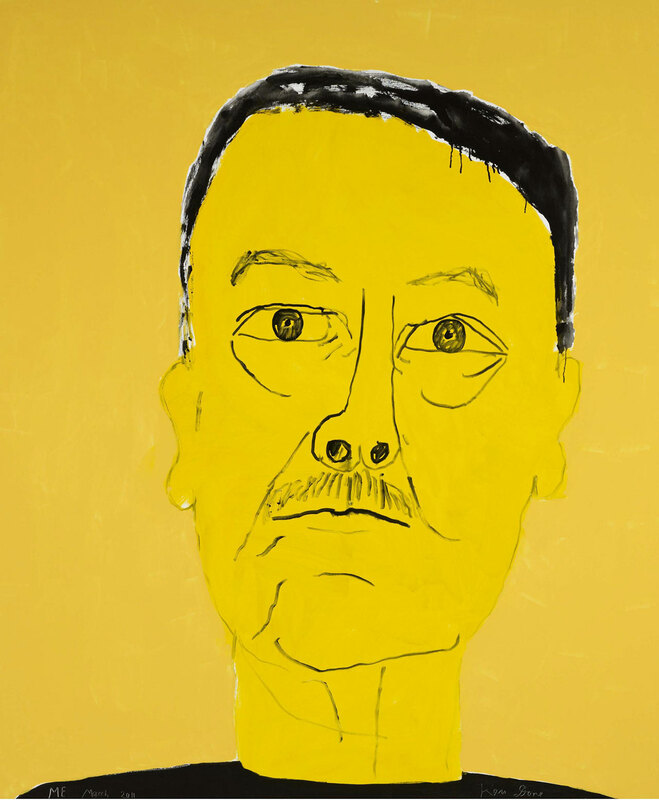 In 2011, at age 70, Done famously survived a brush with prostate cancer, his recovery coinciding with something of a career renaissance that began when his self-portrait Me (pictured above) was selected for the Archibald Prize. Speaking with him, you get the sense that the experience has done little to darken his world view – far from it. Our brief phone call is is like one conducted with a teenager as bright and clear as the mid-winter day outside, furious with all the energy of everything that he still wants to achieve. 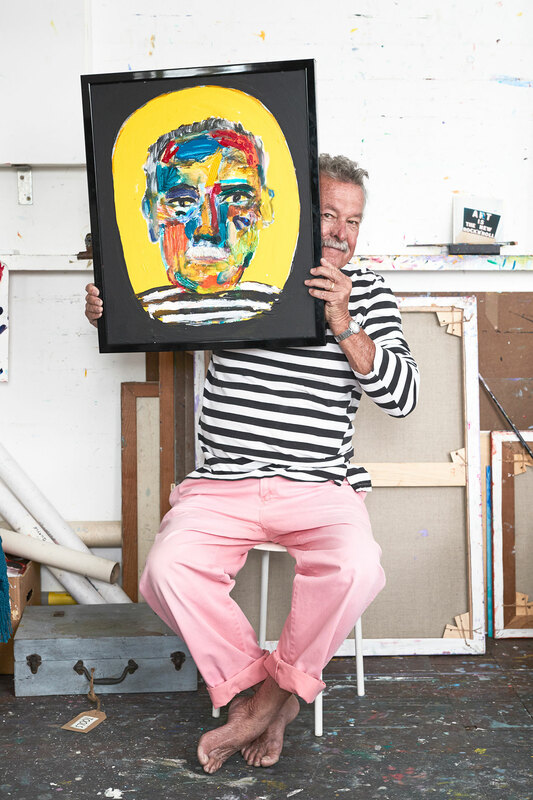 On the inside of his studio doors at his home in Mosman, overlooking Chinaman’s Beach, reads a sign that doubles as a kind of mantra for Done: ‘Painting’s for me’. For the artist, it reinforces the belief that, while it’s great when critics and audiences like his work, first and foremost it has to surprise, thrill and interest its maker before anyone else. Having now almost spent half his lifetime honing his craft, Done sounds as though he’s in no way content to lie back and float down stream just yet. “It’s one of the few professions I think that it takes you about a half a lifetime, maybe even three quarters of a lifetime, to get some idea of what you’re doing. Then you drop off the twig. In other words, stop hesitating and dive in – the water’s warm wherever you are.